Why Should You Apply to Rice Business? Join the next generation of global leaders at the Jones Graduate School of Business at Rice University, one of the best business schools in the U.S. in the country’s most diverse city. Here, we focus on three things: being attentive, responsive and kind. We are proud to welcome a high-quality and diverse student body, with 30 percent international students, 31 percent women, 10% military veterans and 15 percent underrepresented minorities. Come to Rice Business and we’ll help you make your mark on the world. Download the Rice Business Snapshot PDF. 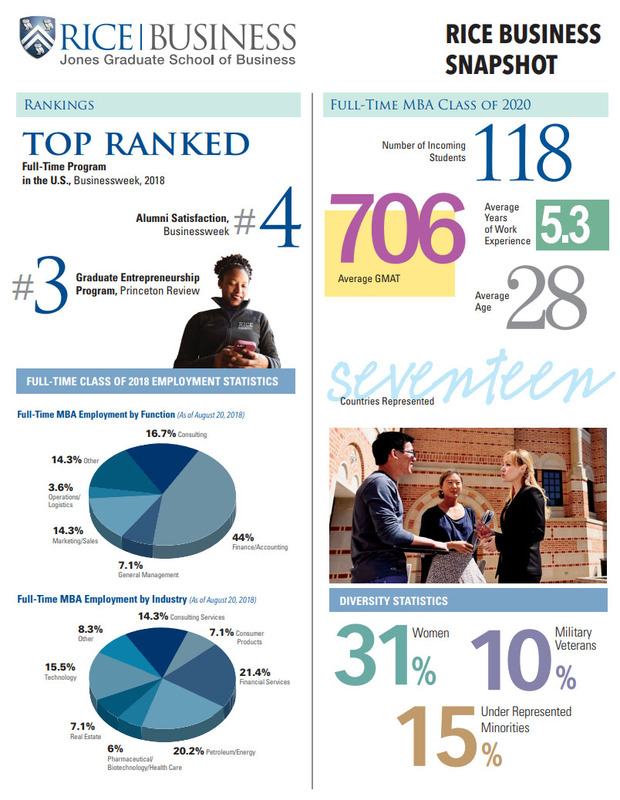 The Jones Graduate School of Business at Rice University is the youngest and fastest rising business school in the country. We’re grateful for the national recognition, but mostly because we care about those who care about the rankings: students, alumni and the companies who hire our graduates. No matter where we stand in the rankings, we’re still going to keep striving to make this the best school for our students, through initiatives like our global experience program and our Office of Diversity and Inclusion. One of the great benefits of Rice Business is our size. All our top-notch faculty and students are on the same campus and in the same building. Our average class size is small — about 40 — and the faculty members know your name. Our alumni make connections with current students as well as fellow alumni. And your classmates stay friends for life. Live, study and play on a spectacular tree-lined campus nestled in the heart of Houston. Come be a part of our small but mighty campus. Rice Business is designed to change you and your career. We have built each program to give you the education and skills you need to advance professionally. Stay where you are and move up the ladder. Or take a leap of faith and try something new. Either way, the Career Development Office is available to meet with you six days a week, with extended evening hours. We will help you intern at organizations like Amazon, ExxonMobil, Goldman Sachs and Texas Children’s Hospital; network with Fortune 500 companies; and gain expert guidance from staff who are as invested in your education as you are. Rice Business is also an internationally recognized leader for educating and producing talented entrepreneurs. We teach all our students how to think and act like an entrepreneur. Whether you’re starting a new enterprise or making something happen inside the company where you already work, the entrepreneurial mindset is a necessary part of any successful person’s tool kit. Think hard. Ask the big questions. Find inspiration. Compose a business plan. Create your passion. Join us. We’re just getting started.